In the first post in the series we discussed the concepts of a covenant and looked at some different types and forms of the covenants. In this post we will be looking at the concept of “breaking a covenant” and how that is different from annulling or voiding an agreement or contract. Here we see that a covenant does not contain cancellation or termination clauses like a contract typically would. What we do see is that we have a list of stipulations that must be kept and then blessing for keeping them and curses for not keeping them. This means that not upholding the stipulations of a covenant does not annul the covenant, it simply brings the penalty clause, the curses, into play. Very often we hear the theory that the original Sinaic covenant has been terminated because of the incident of the golden calf and therefor YHVH had to make another covenant with His people. Even if we make this mistake of treating YHVH’s covenant as a contract, this is not true. Let us do the academic exercise of analyzing this incident under modern contract law. Let me start off by explaining some basic contract law so that we are all on the same page. Disclaimer: Please note that this is a very simple explanation and will not be a tutorial on contract law. Contract law is a really specialized area of expertise and due to my profession as project manager I know just enough to realize that I need an expert when it comes to contracts. The basic training that I have received, simply helps me to avoid making the mistakes. In modern contract law the fact that one party does not perform according to the contract does not automatically give the other parties to the contract the right to annul the contract (make it voidable). In order for the innocent party to end the contract, the term that is broken needs to be a condition of the contract. When a condition of the contract is broken the innocent party has the right (not obligation) to end the contract (rescind) and sue for damages caused by the non-performance of the other party. This right to rescind can also be lost due to several reasons, including delay and affirmation. It also implies that the performance of the innocent party is no longer enforceable as the contract has ended. If it is a warrantee (another form of a term, as opposed to a condition) of the contract that is broken, then the innocent party only has the right to sue for breach of contract. Thus, the innocent party has the right to be restored, not to terminate the contract. If you would like to read a bit more about the basics of contract law (British Contract law to be specific) please have a look at this site. This condition does not mention anything about YHVH breaking His covenant; it is not part of the conditional term. It does imply that if Israel does not obey, they will no longer be His people, but just another one of the nations. 11 Then Moses entreated YHVH his Elohim, and said, “O Elohim, why does Your anger burn against Your people whom You have brought out from the land of Egypt with great power and with a mighty hand? 12 “Why should the Egyptians speak, saying, ‘With evil intent He brought them out to kill them in the mountains and to destroy them from the face of the earth’? Turn from Your burning anger and change Your mind about doing harm to Your people. 13 “Remember Abraham, Isaac, and Israel, Your servants to whom You swore by Yourself, and said to them, ‘I will multiply your descendants as the stars of the heavens, and all this land of which I have spoken I will give to your descendants, and they shall inherit it forever.’ ” 14 So YHVH changed His mind about the harm which He said He would do to His people. Here in verse 14 we see that for several reasons YHVH decided not to harm the Israelites. We all know this was pure grace, but if we put our modern contract law hats on, we would call this an affirmation. YHVH has made the choice to waive His right to rescind. This means that the “contract” is still in force. Thus, it is clear, even if we make the mistake of thinking in terms of contracts, that the covenant did not cease to exist when the Israelites worshipped the golden calf because the right to rescind was not exercised. This also proves clearly that grace is not something that came into force with the renewed covenant after the death of Y’shua. It was already in place from the book of Genesis! Also, if this covenant was broken and terminated, why would Peter quote the exact same words when he talks to the believers? 4 And coming to Him as to a living stone which has been rejected by men, but is choice and precious in the sight of YHVH, 5 you also, as living stones, are being built up as a spiritual house for a holy priesthood, to offer up spiritual sacrifices acceptable to YHVH through Y’Shua ha Messiach. 6 For this is contained in Scripture: “Behold, I lay in Zion a choice stone, a precious corner stone, And he who believes in Him will not be disappointed.” 7 This precious value, then, is for you who believe; but for those who disbelieve, “The stone which the builders rejected, This became the very corner stone,” 8 and, “A stone of stumbling and a rock of offense”; for they stumble because they are disobedient to the word, and to this doom they were also appointed. 9 But you are a chosen race, a royal priesthood, a holy nation, a people for YHVH’s own possession, so that you may proclaim the excellencies of Him who has called you out of darkness into His marvelous light; 10 for you once were not a people, but now you are the people of YHVH; you had not received mercy, but now you have received mercy. Peter is still under the impression that this covenant exists and is still in force. But now, let us return to the correct way of looking at this. Let us treat these promises of YHVH as covenants. As explained earlier, if the stipulations of a covenant are not kept, then the curses of the covenant come into effect. Let us get a bit more specific about the breaking of a covenant. What happens if you person breaks covenant with another person? Even if the covenant is between two people (a parity covenant), YHVH still ensures that the breaker of the covenant suffers the result of his covenantal unfaithfulness. 15 ‘But he rebelled against him by sending his envoys to Egypt that they might give him horses and many troops. Will he succeed? Will he who does such things escape? Can he indeed break the covenant and escape? 16 ‘As I live,’ declares YHVH Elohim, ‘Surely in the country of the king who put him on the throne, whose oath he despised and whose covenant he broke, in Babylon he shall die. Also remember: a marriage is also a covenant between two people where YHVH is called as a witness! What happens if man breaks his covenant with YHVH? In the covenants between YHVH and His people there are some stipulations attached. If His people obey His stipulations, they will receive the benefit of the covenant – the blessings. The covenants have different stipulations and thus different ways in which these could be broken. Let us have a look at some examples of covenants and the result of man breaking these covenants with YHVH. The result of breaking this covenant was death. By introducing sin into the world, man has brought death into the world. 21 For since by a man came death, by a man also came the resurrection of the dead. 22 For as in Adam all die, so also in Messiah all will be made alive. In the previous post, we saw that this covenant is in the form of a royal grant treaty. This implies that there is no obligation on the decedents of Abraham. There are no rules that may not be broken specified here; thus no explicit condition. However, it is an implied condition in any royal grant treaty that the receiver of the grant and his descendants stay loyal to the giver of the grant. For some reason, during the stay in Egypt the nation was not longer loyal to YHVH. We found proof of this in the book of the prophet Ezekiel. 5 and say to them, ‘Thus says YHVH Elohim, “On the day when I chose Israel and swore to the descendants of the house of Jacob and made Myself known to them in the land of Egypt, when I swore to them, saying, I am YHVH your Elohim, 6 on that day I swore to them, to bring them out from the land of Egypt into a land that I had selected for them, flowing with milk and honey, which is the glory of all lands. 7 “I said to them, ‘Cast away, each of you, the detestable things of his eyes, and do not defile yourselves with the idols of Egypt; I am YHVH your Elohim.’ 8 “But they rebelled against Me and were not willing to listen to Me; they did not cast away the detestable things of their eyes, nor did they forsake the idols of Egypt. Then I resolved to pour out My wrath on them, to accomplish My anger against them in the midst of the land of Egypt. 9 “But I acted for the sake of My name, that it should not be profaned in the sight of the nations among whom they lived, in whose sight I made Myself known to them by bringing them out of the land of Egypt. 10 “So I took them out of the land of Egypt and brought them into the wilderness. Thus, they were being cursed via slavery and oppression under the Egyptians. 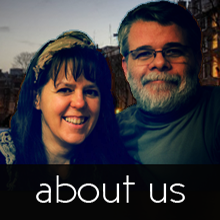 By the grace and mercy of YHVH, they were saved out of their slavery. The covenant with Abraham was the reason YHVH delivered the Israelites out of Egyptian captivity. He is a covenant-keeping Elohim! 24 So YHVH heard their groaning; and YHVH remembered His covenant with Abraham, Isaac, and Jacob. YHVH remembered the covenant He made with their forefathers and brought the repentant Israelites (if we assume that the groaning was repentance) out of captivity; back to the land of Israel that He had promised to Abraham. Thus the grant to Abraham still stayed intact, even thought the descendants did not stay loyal to YHVH. Yet again, alone by His grace! The covenant at Sinai is a typical Suzerainty covenant (as detailed in the previous post) that had stipulations that Israel had to keep. We also see recorded in Scripture the result of them not obeying these rules. 14 ‘But if you do not obey Me and do not carry out all these commandments, 15 if, instead, you reject My statutes, and if your soul abhors My ordinances so as not to carry out all My commandments, and so break My covenant, 16 I, in turn, will do this to you: I will appoint over you a sudden terror, consumption and fever that will waste away the eyes and cause the soul to pine away; also, you will sow your seed uselessly, for your enemies will eat it up. Here we see that the nation can break the covenant by not obeying YHVH and carrying out His commandments. The result of this is not the annulling of the covenant, but it causes the nation to be cursed as described in the rest of Leviticus 26. The nation was again given the commandment to obey the Sabbath. 14 ‘Therefore you are to observe the sabbath, for it is holy to you. Everyone who profanes it shall surely be put to death; for whoever does any work on it, that person shall be cut off from among his people. In the book of Numbers, we see the result of a person not keeping this commandment. The result of this action has an effect on the person, but not on the nation. Thus the individual that had broken the covenant, suffered the direct result of sin – death. The rest of the nation did not suffer. An example of the acts of individuals placing a curse upon the whole nation can be seen in Joshua where an individual took things that were under then ban and the nation was defeated in war. 1 But the sons of Israel acted unfaithfully in regard to the things under the ban, for Achan, the son of Carmi, the son of Zabdi, the son of Zerah, from the tribe of Judah, took some of the things under the ban, therefore the anger of YHVH burned against the sons of Israel. 11 “Israel has sinned, and they have also transgressed My covenant which I commanded them. And they have even taken some of the things under the ban and have both stolen and deceived. Moreover, they have also put them among their own things. 12 “Therefore the sons of Israel cannot stand before their enemies; they turn their backs before their enemies, for they have become accursed. I will not be with you anymore unless you destroy the things under the ban from your midst. Here, the whole nation was punished via a war they lost for the actions of Achan. Eventually his complete family had to suffer the curse of his sin. 24 Then Joshua and all Israel with him, took Achan the son of Zerah, the silver, the mantle, the bar of gold, his sons, his daughters, his oxen, his donkeys, his sheep, his tent and all that belonged to him; and they brought them up to the valley of Achor. 25 Joshua said, “Why have you troubled us? YHVH will trouble you this day.” And all Israel stoned them with stones; and they burned them with fire after they had stoned them with stones. Once the nation had cast this sin from their midst, they were completely restored to the covenant again and YHVH gave them victory over the enemy. We also see many examples in scripture where the nation of Israel did not keep these commandments (including not worshiping idols). In every case, they were cursed in some way and upon their return to YHVH, were restored to His covenant. During the time of the judges we see that YHVH had to send 15 judges (including Eli and Samuel) to restore the nation after they had been oppressed by their surrounding neighbors. During the time of the kings, we see several kings, including Asa, Jehoshaphat, Joash, and Uzziah restoring the nation to YHVH. Not all of them were truly successful in their restoration attempts. However, never does YHVH break His covenant with Israel; He remains their Elohim. He punishes them as He promised, but then when they do return to Him, He restores His covenant with them. The nation of Israel was given the commandment to observe the Sabbatical (7th) and Jubilee (50th) years once they had entered the land and became a free nation with a land of their own. 2 “Speak to the sons of Israel and say to them, ‘When you come into the land which I shall give you, then the land shall have a sabbath to YHVH. 3 ‘Six years you shall sow your field, and six years you shall prune your vineyard and gather in its crop, 4 but during the seventh year the land shall have a sabbath rest, a sabbath to YHVH; you shall not sow your field nor prune your vineyard. Later in the book of Leviticus, we are also told that the people will be sent into exile if they do not allow the land to enjoy its Sabbaths. 34 ‘Then the land will enjoy its sabbaths all the days of the desolation, while you are in your enemies’ land; then the land will rest and enjoy its sabbaths. 35 ‘All the days of its desolation it will observe the rest which it did not observe on your sabbaths, while you were living on it. However, the nation as a whole did not obey these commandments and did not allow the land to rest and/or set their slaves free. The curse that was put upon the nation as a whole was the curse of the sword and eventual deportation of the nation to foreign lands (Assyria and Babylon). 19 Then they burned the house of YHVH and broke down the wall of Jerusalem, and burned all its fortified buildings with fire and destroyed all its valuable articles. 20 Those who had escaped from the sword he carried away to Babylon; and they were servants to him and to his sons until the rule of the kingdom of Persia, 21 to fulfill the word of YHVH by the mouth of Jeremiah, until the land had enjoyed its sabbaths. All the days of its desolation it kept sabbath until seventy years were complete. Yet the prophet Jeremiah had prophesied before the exile to Babylon that YHVH would put an end to the exile after seventy years. 11 ‘This whole land will be a desolation and a horror, and these nations will serve the king of Babylon seventy years. 12 ‘Then it will be when seventy years are completed I will punish the king of Babylon and that nation,’ declares YHVH, ‘for their iniquity, and the land of the Chaldeans; and I will make it an everlasting desolation. Thus we see here the nation breaking the covenant with YHVH and their punishment as a result. We also see that this is a curse and not the annulling of the covenant, as Jeremiah prophesied before that this would only be a temporary arrangement. We find several scriptures where YHVH makes it clear that His covenant is made not only with a specific person, but also with his descendants. This means that the covenant is forever. In some case we also have the covenants being explicitly called an everlasting covenant. Let us look at proof points for some specific covenants. The covenant made with Noah after the flood is an everlasting covenant as it is made with Noah and with his descendants after him. 7 “I will establish My covenant between Me and you and your descendants after you throughout their generations for an everlasting covenant, to be Elohim to you and to your descendants after you. Thus, it is very clear that this covenant that promises Abraham a dynasty and a land, is made with him and all his descendants and this will be everlasting. I do not think we can get it much clearer than that. When the nation of Israel did not stay faithful to YHVH, He told Moses and His prophets that He would punish the nation by sending them out of the land. However, even before Judah was sent to Babylon He had already told His prophet that He would bring them back to the land that He had given to Abraham and his descendants. As we see in Genesis, YHVH calls this an everlasting covenant. If they are no longer loyal to YHVH, He punishes, but does not forget. 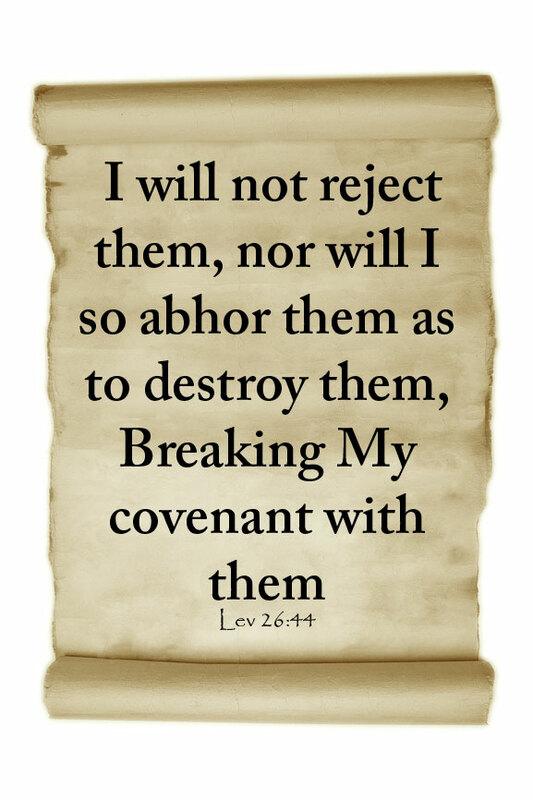 YHVH explicitly states that He will not break this covenant, even if Israel breaks it. 44 ‘Yet in spite of this, when they are in the land of their enemies, I will not reject them, nor will I so abhor them as to destroy them, breaking My covenant with them; for I am YHVH their Elohim. 45 ‘But I will remember for them the covenant with their ancestors, whom I brought out of the land of Egypt in the sight of the nations, that I might be their Elohim. I am YHVH.’ ” 46 These are the statutes and ordinances and laws which YHVH established between Himself and the sons of Israel through Moses at Mount Sinai. 36 “Now therefore thus says YHVH the Elohim of Israel concerning this city of which you say, ‘It is given into the hand of the king of Babylon by sword, by famine and by pestilence.’ 37 “Behold, I will gather them out of all the lands to which I have driven them in My anger, in My wrath and in great indignation; and I will bring them back to this place and make them dwell in safety. 38 “They shall be My people, and I will be their Elohim; 39 and I will give them one heart and one way, that they may fear Me always, for their own good and for the good of their children after them. 40 “I will make an everlasting covenant with them that I will not turn away from them, to do them good; and I will put the fear of Me in their hearts so that they will not turn away from Me. YHVH also made a covenant with King David that his throne shall be established forever after his death. Later in one of the Psalms, we have a description of what YHVH had said to His godly ones. Here we see that YHVH states that even though the sons of David will not keep His commandments, he will punish them but His covenant will not be violated. 30 “If his sons forsake My law and do not walk in My judgments, 31 If they violate My statutes And do not keep My commandments, 32 Then I will punish their transgression with the rod And their iniquity with stripes. 33 “But I will not break off My lovingkindness from him, Nor deal falsely in My faithfulness. 34 “My covenant I will not violate, Nor will I alter the utterance of My lips. 35 “Once I have sworn by My holiness; I will not lie to David. 36 “His descendants shall endure forever And his throne as the sun before Me. From this study, we have seen that YHVH has made several everlasting covenants with His people. These covenants do contain explicit or implicit stipulations. Although Israel has broken these covenants by their disobedience and unfaithfulness, YHVH has chosen to still keep these covenants as everlasting covenants. When we break these covenants, we do experience the results and we have to suffer the curses that are contained in these covenants. These curses could have a result on ourselves or the nation as a whole. Our repentance of our sins brings us in good covenantal standing with YHVH. In the next article we will start looking in more detail at specific covenants. Please ensure that you subscribe here to our e-mail list to ensure that you do not miss it. The Fourth Commandment - Part 1 - Who Changed It? You may have already addressed this question before, but I’d like to know more about the covenant Yeshua put in place. I’m not really understanding the terms and conditions of that covenant. Who did He make it with? Was it just for the Lost Tribes of Israel? At the Last Supper, I don’t see Him making any conditions or setting the terms of the covenant. This question has not yet been adressed but I do plan to adress it in one of the future articles in the series. Please keep reading. This question has not yet been adressed but I do plan to adress it in one of the future articles in the series. Please keep reading! Exo 32:10 Now therefore let me alone, that my wrath may wax hot against them, and that I may consume them: and I will make of thee a great nation. xo 32:31 And Moses returned unto the LORD, and said, Oh, this people have sinned a great sin, and have made them gods of gold. Exo 32:32 Yet now, if thou wilt forgive their sin–; and if not, blot me, I pray thee, out of thy book which thou hast written. This is the event that killed off the rebuilding of the Melchizedek Priesthood. Moses refuses to go along with God’s prescription. What is the result of this action? Up pops the Levitical Priesthood. Aaron could no longer be a Melchizedek high Priest. He disqualified himself by taking his part in making the golden calf, and leading the worship of it. Exo 33:3 Unto a land flowing with milk and honey: for I will not go up in the midst of thee; for thou art a stiffnecked people: lest I consume thee in the way. Exo 33:4 And when the people heard these evil tidings, they mourned: and no man did put on him his ornaments. Exo 33:5 For the LORD had said unto Moses, Say unto the children of Israel, Ye are a stiffnecked people: I will come up into the midst of thee in a moment, and consume thee: therefore now put off thy ornaments from thee, that I may know what to do unto thee. Yah was very angry. He said he would not go in the midst of them (Ex 33:3). Exo 34:1 And the LORD said unto Moses, Hew thee two tables of stone like unto the first: and I will write upon these tables the words that were in the first tables, which thou brakest. Exo 34:2 And be ready in the morning, and come up in the morning unto mount Sinai, and present thyself there to me in the top of the mount. As you continue to read, you will see the addition of more laws. All of these make up the Levitical Priesthood. In some cases, the laws of the Levitical Priesthood look just like the laws of the Melchizedek Priesthood except, they are different. Look at the feasts for example. The Levitical Priesthood contained sacrifices for each day of Unleavened Bread and Tabernacles, but the Melchizedek Priesthood feasts do not. If the golden calf had not taken place, you would have see the Children of Israel becoming priests, working in a Melchizedek Priesthood with gifts of the Holy Spirit and everything. But instead, we had to wait until Yahshua could come and rebuild it in His blood. As far as the covenant made in the Levitical Priesthood… What covenant? I cannot see a blood covenant made anywhere! That by itself has huge implications. Because I can show you where Yahshua used His blood to rebuild the covenant in the Melchizedek Priesthood. The blood is significant. Gal 3:19 Wherefore then serveth the law? It was added because of transgressions, till the seed should come to whom the promise was made; and it was ordained by angels in the hand of a mediator. This verse asks a question: What is the purpose of the Levitical law? it was added because of the golden calf transgression. It was added until Yahshua came. So, the Melchizedek Priesthood was stopped before it could be restarted at Sinai. since Moses would not go along with Yah’s plan, the Levitical priesthood was created until Yahshua could get it re-established. Thanks for your opinion. I am happy to share different opinions as long as it can be discussed in a loving and respectful way. We have enough enemies in the world! I do not believe that this priesthood has been terminated. We have multiple scriptures to proof that YHVH had established an everlasting covenant of salt (not blood) with them. 29 Remember them, O my Elohim, because they have defiled the priesthood and the covenant of the priesthood and the Levites. Thus, if the priesthood had been terminated it could not be an everlasting covenant. If we believe that YHVH had kept his covenant with David, by sending us Y’shua, why do we not also believe verse 18 that promises a continual Levitical priesthood. We also have the covenant that YHVH made with Phineas, the priest. We also find proof that Zadok was a direct descendent of Phineas. And in Ezekiel we see that the sons of Zadok will be serving as priests in the temple that is described by Ezekiel. I think we all agree that this temple still needs to be built. Thus, the Sons of Zadok from the tribe of Levi still need to serve as priests in this temple. This proofs to me that the priesthood will still exist in the future. Also, please note that in Ezekiel’s description of this temple, there is no reference to a high priest. 19 ‘You shall give to the Levitical priests who are from the offspring of Zadok, who draw near to Me to minister to Me,’ declares YHVH Elohim, ‘a young bull for a sin offering. What is main topic of Hebrews 7 & 8, the priesthood of the High Priest? What the writer of Hebrews is describing here is how Y’Shua is a superior High priest as compare to human high priests. This is the reason that the author gives at the end of chapter 7 for why it is better. 23 The former priests, on the one hand, existed in greater numbers because they were prevented by death from continuing, 24 but Y’Shua, on the other hand, because He continues forever, holds His priesthood permanently. 25 Therefore He is able also to save forever those who draw near to YHVH through Him, since He always lives to make intercession for them. Here you can see he is only refering to “one” not many. Thus Hebrews 7&8 is for me a midrash that explains why Y’Shua is the superior High Priest and because He is now the High Priest we no longer need any laws that tell us what the high priest has to do or how he is to be dressed. Thus, the law has to be changed to “remove” the laws regarding the high priest. Nothing else changes. We have a new High Priest and he isn’t human. By looking at Hebrews 7, where the meeting of Abraham and the King of Salem is described, we see that Aaron was disqualified from birth from this priesthood. The order of Melchizedek is not a human priesthood. Only Y’Shua could be the High Priest of this order. When He had finished speaking with him upon Mount Sinai, He gave Moses the two tablets of the testimony, tablets of stone, written by the finger of YHVH. Thus the rules for the priesthood were given before the first tablets were destroyed, prior to the golden calf. 2. What transgressions are being referred to in Gal 3:19? Could it also be refering to the transgressions prior to the giving of the law to Moses (sins in Egypt as being described in Jeremiah 11:7-8)? We cannot say with certainty that the Law was given because of the golden calf. The nation had offered to idols already in Egypt. I will also be adressing more of these topics in my future articles. I posted this question/comment earlier, and I’m wondering if you had addressed it yet…..?